Brief Synopsis: The Justice League mourns Ice as it fractures under pressure of opposing philosophies. Inside a hospital, Blue Beetle II oversees Booster Gold's examination by Doctor Klaus. Booster's hospital stay is being funded at least partially by $50,000 that Blue Beetle was paid for giving the true story of Ice's death to a television tabloid show as seen in Justice League International, Vol. 2, #67. Note that the doctor refers to Booster as "Mr. Carter," revealing that she knows his given birth name, Michael Jon Carter. As mentioned in Justice League America #38, Booster Gold's legal, government-recognized name in the 20th century is "Booster Gold." Because the only thing keeping Booster Gold alive and ensuring that his heart is still beating is the life-support systems built into Booster's Mark IV armor, Doctor Klaus reveals that Booster is essentially trapped inside his armor until a heart and lung transplant can be arranged. This is exactly the situation that rival Marvel Comics armored hero Iron Man found himself in when he originally built his Mark I armored battle-suit. Blue Beetle and Booster Gold participate in a little, old-fashioned comedic banter as they prepare to deliver Ice's body back to her remote Scandinavian homeland. Beetle mentions that Booster is "already dead." And he's telling the truth; in recent events throughout the Justice League titles, Booster Gold was combating the Overmaster despite being legally dead. 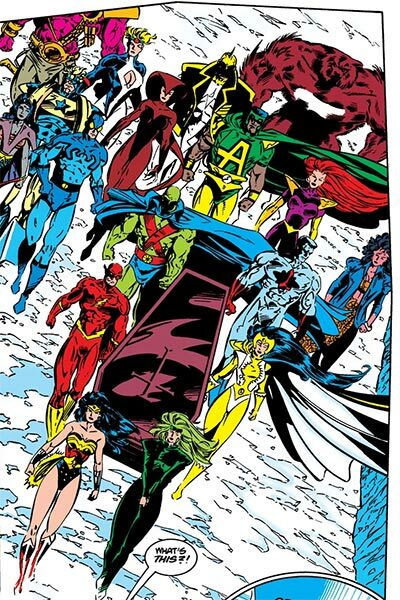 Amazing Man II, Blue Beetle II, Booster Gold, Captain Atom, Crimson Fox, Dr. Light IV, Fire, Flash I, Flash III, Gypsy, L-Ron/Despero, Martian Manhunter, Maxima, Maya, Power Girl, Ray II, Tasmanian Devil, and Wonder Woman accompany Ice's body to her homeland for her funeral. Maxwell Lord had previously asked to accompany them, but he is not shown. Boosterrific Review: This issue would have been far improved in the hands of a more fluent artist. 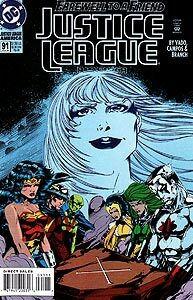 Because every character is only capable of expressing her- or himself by shouting or grimacing, any of the more subtle emotions that could (and should) be expressed upon the death of a longtime Leaguer are lost in the limited facial expressions available. This results in a very disappointing and unsatisfying final farewell to a fan favorite character.